While we were in the late stages of making “All The Rage,” my partner Suki was very focused on the edit, and I began to shoot more on a separate project – work related to protest. 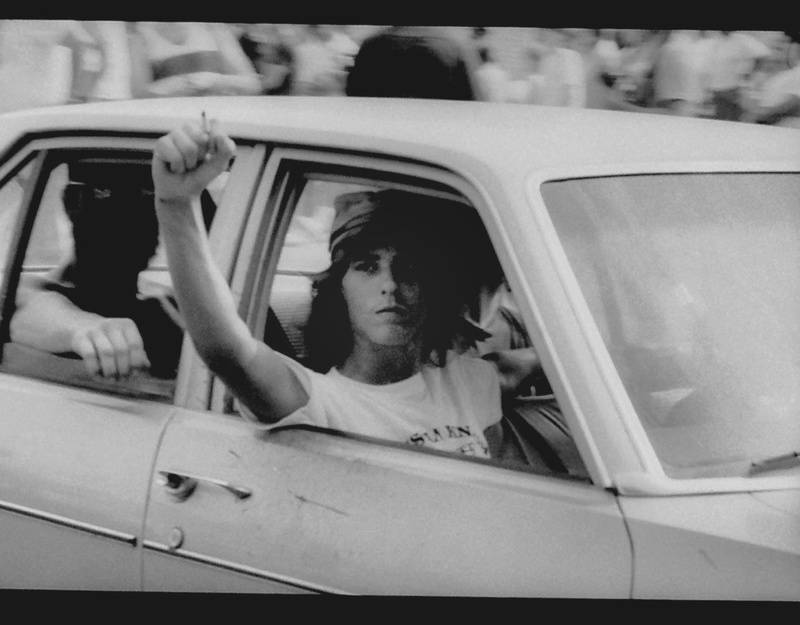 The short pieces I was making were part of the process of constructing the film we’d finish next, “Working In Protest”. As this film was largely pieced together form previous work, we were able to make it very quickly and ended up traveling to a number of film festivals with both films. While they are very different in form and structure, both films delve into ideas related how we interact in the world and how those interactions intersect with political and cultural realities that impact our lives. 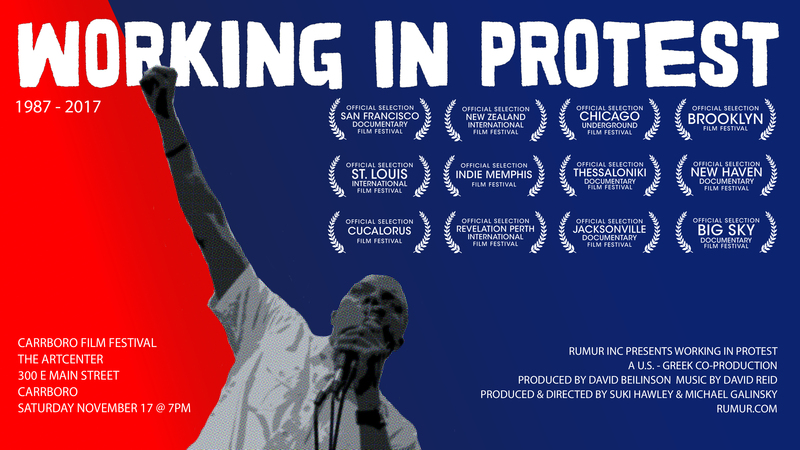 In general, people expect “Working In Protest” to be an activist film, but it’s not. The goal from the very beginning, over 30 years ago, was to document situations from an observational perspective. It’s also an oddly personal film, as all of it is constructed from things that I shot over that 30 year period, starting with a Klan Rally in 1987 and ending at the Inauguration of Donald Trump. We didn’t set out to make it with a plan, but instead pieced it together from things we happened to capture; some things for other projects, and some pieces filmed after we had an idea of what we were doing. While I will readily admit that my views tend more towards what might be called liberal, the work that we have made is not “liberal activist” work. While most of the pieces feature liberal people protesting, that’s what we happened to experience more of. We weren’t anywhere near a tea party rally (or we would have shot it). With our work, we try to raise questions rather than make concrete arguments or points. It’s not always easy to stay neutral on a moving train, but in the end, when you start out with an open perspective the work breathes more, and holds up better over time. Part of the reason we have taken this approach is that work that is very directed towards a particular point of view isn’t as useful for creating conversations. What we want our work to do is challenge people to broaden their perspective – not harden it. When one makes an argument, those with an existing point of view that runs counter to the one proposed will immediately seek reasons to reject it. Currently, I am struggling with the amount of division we have in this country. The tribalism of our political situation is not leading us in a good direction, and the stress created by this division spills over to our personal lives. (Shortly after typing that sentence my wife walked in and asked if I’d heard about the bombs that had been sent to Obama, Clinton, and many others). My daughter is beset with anxiety that has led to panic attacks. Some of her issues are related to the ideas at the core of our film “All The Rage” (she puts enormous pressure on herself to excel in school and in other ways), and some of it has to do with the political polarization, which makes the world feel particularly unsafe. There are other family issues going on that have led me to look more deeply at myself. One thing that has become clear to me is that in my family I fell into the role of mediator – often feeling responsible for helping everyone else to get along. The first line of “All The Rage” is, “The stories that we tell ourselves about ourselves shape our sense of who we are.” When I look back at all our work as filmmakers, I can see that it is often about trying to find a middle ground. While I think those stories can have a healing effect, they are difficult to get out into the world because people want their truth at one end of a spectrum. They want clarity, not complexity, and this is wildly more clear now than I have ever seen it. 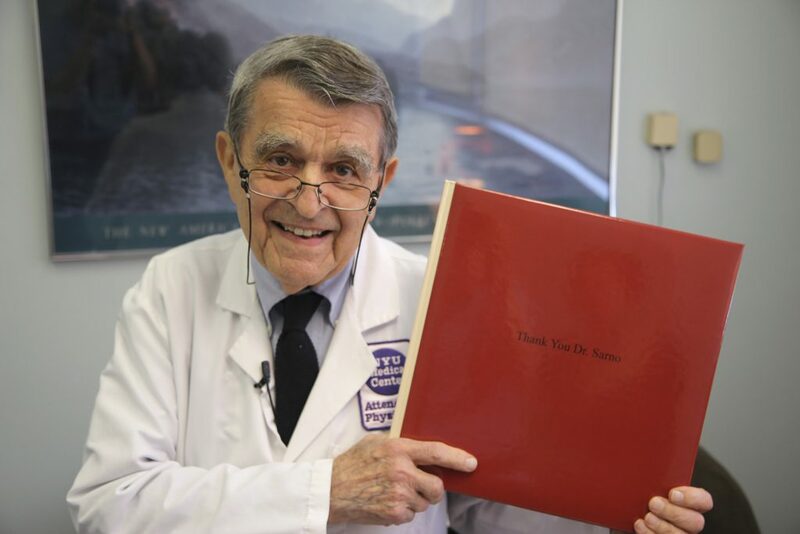 The last line of “All The Rage,” our film about the teachings of Dr. John Sarno, is uttered by the man himself: “It all comes down to one simple idea. The mind and the body are intimately connected. That’s the whole story.” While many people become quite dogmatic about Sarno’s ideas and his writings, in the end everyone has their own path to follow. While we would likely have attracted a larger audience if the film had been a bit more dogmatic or explanatory, I believe that would have made the film much less useful. By the end of the film, that quote has the most profound meaning. Things are both more simple and more complex than we want to believe. It’s our stories that shape our reality, yet we can also shape our story…which means we have profound power over our reality. Yet we can’t control what happens. There are Catch 22’s around every corner, which means that accepting what comes along is a very healthy way to be. Yet we protest injustice because to do nothing in the face of it is to be complicit with it. 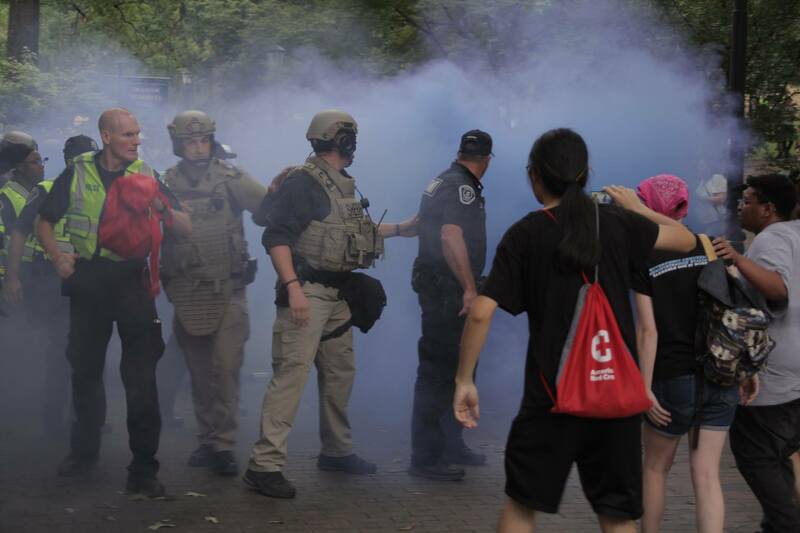 End Family Separation Rally – Chapel Hill, NC – June 30, 2018 from rumur on Vimeo. Like most of our films, when we can get “Working In Protest” in front of an audience the response is quite thoughtful and profound. However, because the film isn’t “activist,” it is much harder to get it in front of an audience. Often times, as filmmakers, we are told to know who our audience is, because that way you can connect with them, and market the film to them. After finishing “Working In Protest,” we continued to shoot local political events, including those related to conflicts about Confederate statues. As with “Working In Protest,” we kept ourselves on the fringes of those events because we didn’t want to make advocacy work. While our own belief was that the Confederate statue on the UNC campus should come down, our goal in shooting was simply to document what took place. Over the past year, we shot a number of events, including the eventual toppling of the statue as well as the pro-statue rallies that took place after that event. Last week I went to shoot at the Courthouse where people were gathered for a trial of of some of the people who took down the statue. At a couple of previous events, the protesters have set up solidarity tables with food and coffee for those who came out to support the people on trial. This time there was no gathering place, so rather than go stand with the protesters I grabbed a shot of the building and then one of those who were assembling. I wrote about this here– but to paraphrase, I was stalked by some protesters who didn’t want to be filmed. I tried to explain who I was, but they treated me with distinct distrust. The whole situation highlighted just how bad the division has become and was so upsetting that I left. A couple of days later, I sent in a proposal for fiscal sponsorships to an organization that has helped us take in donations in the past. This group has supported some really great films and I’ve met other passionate filmmakers through them. Further, their internship program has landed us some smart helpful interns. While we don’t see eye to eye on every political issue, we have always had good relations. I sent them the proposal and they refused because they interpreted “Working In Protest” to be deeply partisan in a way that would put their non profit status in danger. However, as I wrote back, the film doesn’t take any political positions, nor does it make any arguments. 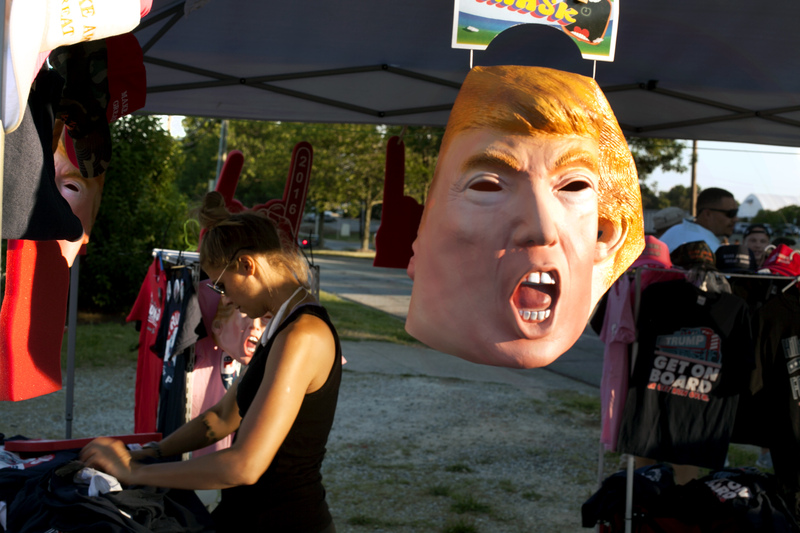 While the film includes footage from protestors at a Trump rally and the Inauguration, it also includes voices of supporters of Trump at both events. In the end, we figured out a way to work together by directing the funds towards another project. Their response to the work reminded me of the Kavanaugh hearings. When viewing him on TV, it was apparent to me that he was not only lying, but that he was acting in a partisan way that was deeply inappropriate for a judge. I was not alone in that awareness, as literally thousands of legal professors signed a letter stating as much. To later find that the performance was praised by people who shared his political beliefs was hard to comprehend. In this space of heightened tribalism, it’s hard to find anyone who will trust you unless you are completely aligned with their tribe. If, like us, you don’t want to be in a tribe, this can be quite disconcerting. It is especially difficult for me because I always want to (almost need to) bring people together. It’s a learned behavior from childhood that certainly isn’t a negative- but it can feel quite difficult when there is so much resistance to listening. We’ll keep doing what we do, trying to capture with as little judgement as possible, and hope for the best.